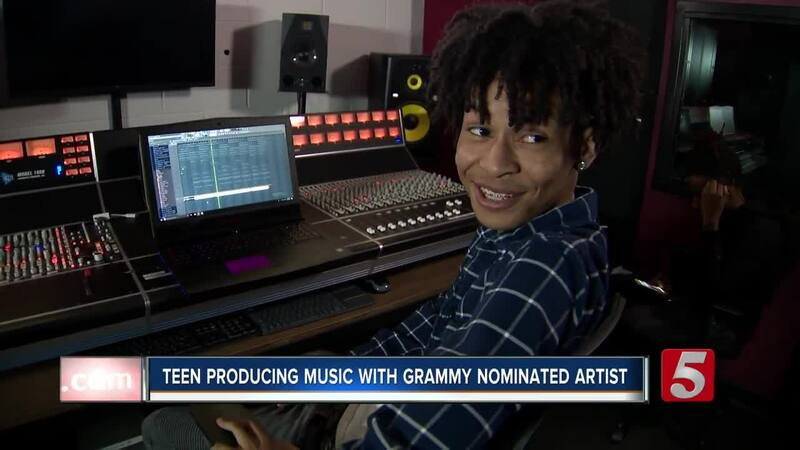 NASHVILLE, Tenn. (WTVF) — A local teen's musical talent is gaining the attention of one Grammy-nominated producer. James Spencer IV, 16, fell in love with creating music at a young age when his father put a small studio set in his room. "I was just learning how to like work the program. It took me about a year which is really fast. Other people they say takes them a long time but I just learned it really quick," he said. The Nashville Big Picture High School junior belongs to a program Notes For Notes . The organization provides after-school recording studios inside Boys & Girls Clubs to youth. Mentors allow participants the opportunity to explore, create, and record music for free. "I'm always working, always I think about it all the time. Sounds really, I just love sounds," he said. At 15, Spencer's talent caught the attention of Grammy-nominated multi-platinum producer Tay Keith. The Memphis native and Middle Tennessee State University graduate has worked with artists like Drake, Travis Scott, and Eminem. A song the 16-year-old had produced caused Keith to offer him a producer contract. Something the novice said was humbling. "I was just cheesing the whole time, it was the whole contract right there. I was just cheesing the whole time. It's nice actually, I like his sound. It's different. It's Memphis type of sound. I like it though," he said. In the music industry, Spencer IV goes by IVbeatss. He credits his emerging success to his manager Nicholas Brownlow and his father, James F. Spencer III, who was also a producer. "I'm very proud of my son, this is a dream of his. It was a dream of mine at one time but you know, life catches you. You have to come out the starving artist role and make money to provide for your family," Spencer III said. The family said the Notes For Notes program is something all young talent should take advantage of. "A lot of people don't know about it. I'm not sure why because it's in the Boys & Girls Club. It's open to the Boys & Girls Club students. I wish a lot of people would take advantage of it because that would keep them focused on something. If they have something to follow than they'd stay out of these streets doing stuff that they're not suppose to be doing," Spencer III said. Spencer IV also mentors kids at the Boys & Girls Club.